The view from my hotel in Edinburgh. 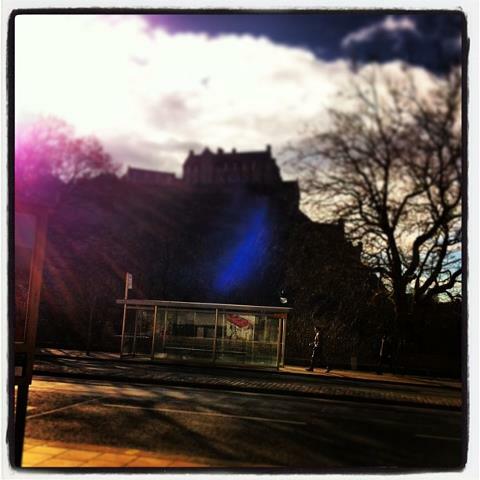 What takes precedent within this photograph I took is not the magnificent castle but instead the unexpected bus stop. Within a group context, what takes precedent is often the unexpected too. I guess I have always considered myself and have been described as others as the outsider to the process of change happening within an organisation such as a school. My role if anything has been to help facilitate an evolving state of change concerning professionalism, the raising of standards, articulation of pedagogy and values of education, families and community through facilitating learning groups and 1-1’s or 1-2’s sessions with educators, teachers and senior management. In recent times I have networked groups together nationally and across international borders with the idea of working together as a group as a powerful motivator for change. I have done much of this, if honest as something I enjoy and find challenging but without much theoretical underpinning, instead applying what I know about children and learning groups to the idea of working with adult learning groups. Therefore, the course at the Edinburgh Gestalt Institute sounded a great way to think about what I do but from a different point of view beyond the realm of educational theory. Loris Malaguzzi (founder of the Reggio Emilia approach to Early Education) reminds us of the importance to read, understand and question from a multi-disciplinary stance as does Gregory Bateson (English anthropologist, social scientist, linguist, visual anthropologist, semiotician and cyberneticist) whose work spanned many different fields of thought and action. What I attempt to do here is share some of my thinking around what I have understood and what I am now thinking about. Some people have requested I share something of what I have encountered in my time in Edinburgh, it doesn’t represent everything I did but gives a flavour of the intensity of the work and learning. You can download Learning Interventions in Organisations which is copy of the full article I have written as it is too big for a blog post. I hope you find it of interest and please do make comment, ask questions, agree and disagree with its content.